COHA will shortly release an overview of what it sees as possible conceptual shortcomings in the Center for Strategic and International Studies’ (CSIS) November 2007 report entitled “Back from the Brink: Evaluating Progress in Colombia, 1999-2007.” In its assessment of the CSIS research project, which was contracted with the White House Trade Office, COHA researchers argue that the organization’s traditional account of Colombian realities had nicely satisfied the Bush administration’s expectations, and therefore its convictions may have preceded its research. Whatever the truth of this assertion may be, the CSIS document certainly projects the wrong signal when it comes to avoiding appearances of any conflict of interest, as well as raising questions whether the document was an example of tethered research for President Bush’s White House Trade office, the report’s principle sponsor. Certainly, this office was counting on a highly favorable finding in order to buttress its already intense campaign for a positive U.S. Congressional vote on the embattled pending free trade pact with Colombia. Unfortunately, there never was much of a prospect that the CSIS study would eventually surprise many people by not turning in a completely predictable result. With the participation of a former senior State Department official, Peter DeShazo, who heads CSIS’ Americas Program and is one of the authors of the report (who hasn’t been particularly known as a maverick on Latin American free trade matters), there never was much prospect that the research project would provide any damning anti-free trade ammunition to its enemies. Characteristically, CSIS has been relatively predictable when it comes to a hardline approach regarding Colombia, and seldom has expressed any non-orthodox formulas for the country that could offend the Colombian military or cast Bogotá’s current drug and national security policy in a negative light, no matter how much stress such a strategy overlooking of the country’s problems could place on its human rights observance. The fact is that when it comes to CSIS, the Bush administration had long received for free the same kind of tendentious politically conservative research for which it was now prepared to pay, and the enthusiasm on the part of Colombian officials over the CSIS document is both to be anticipated and lamented. Now that the efforts of President Hugo Chávez to free several Colombian political prisoners seem to be close to fruition, some legislative figures in Brasilia, who at times apparently confuse their country with Honduras when it comes to a well-ripened capacity for corruption and other banana republic antics, may have been a bit too hasty in turning from vending their votes on pending legislation to more esoteric political matters. This is because legislative venality has become a target for public opprobrium from Brazilians in all walks of life. It was this kind of behavior that appeared to originally inspire Hugo Chávez to famously describe, in a perhaps impolitic manner, some members of Brazil’s upper house as being Washington’s “parrots.” Now some of those legislators seem to have contracted to carry out some further mischievous works on Washington’s behalf by attempting to block Venezuela’s prospects of being voted into the Mercosur trade pact. According to Latin News, several Brazilian brave hearts, such as Senator Heráclito Fortes and Congressman Raul Jungmann, have belittled Chávez’s humanitarian role after the latter had first accepted Colombian President Alvaro Uribe’s invitation to act as an intermediate in trying to obtain the release of several of the hostages being held by the leftist Colombian guerrillas, the FARC. Jungmann, who heads Brazil’s congressional Foreign Relation’s Committee, accused Chávez of “self promotion” and asserted that the Venezuelan effort had no interest in saving “the lives of the hostages,” while Fortes dismissed Chávez’s labors as being little better than another example of his “pyrotechnic” initiatives. The two legislators did this by ridiculing the Venezuelan President’s sincerity and well-intended bona fides in seeking an early release of the hostages. If Chávez is guilty of anything, it was that he overestimated Uribe’s personal stability and that before the Colombian leader had preemptively dumped the Venezuela President, he had repeatedly sabotaged the Venezuelan leader’s hostage-release efforts or needlessly made them even more difficult to carry out. Washington understandably has all along been anxious to score points against the despised Hugo Chávez by depreciating what it saw as his then vain, if offish, role in seeking to gain the release of hostages caught up in the bitter Colombian conflict. But the mystery remains: what was in it for Bogotá to play such a spoiler’s function—why did Uribe, by ridiculing Chávez’s release efforts, do something which on the surface did so little for Colombia as well as his own increasingly precarious domestic political standing? It was obvious that President Uribe, who certainly is no marplot, was looking for a fracas when he preemptively revoked Hugo Chávez’s credentials to potentially negotiate a hostage swap. If so, this represented an abrupt change of style. Soon after taking office in 2002, Uribe admirably fought for autonomy from U.S. dominance in order to maintain a constructive and engaged relationship with his counterpart in neighboring Venezuela. Both leaders have had to work to contain major bilateral crisis situations—be it the abduction of a high FARC official from Caracas or an alleged Colombian-related plot to assassinate Chávez—that could have severely poisoned their economic and political ties. No matter how grating or provocative was the divisive incident, both sides have always managed to draw back from the brink. This included such incidents as the aforementioned abduction and later extradition to the U.S. of the senior FARC official by some local bounty hunters in the pay of Colombian intelligence agents, as well as efforts by the then U.S. ambassador to Bogotá to try to pressure Uribe to seek a confrontation vis-à-vis Venezuela over several bilateral issues. Uribe’s original decision to work through Chávez on the hostage issue had real prospects of paying off because there was every reason to believe that Chávez was close to achieving some success with FARC’s senior leadership, which could reverse Uribe’s plunge in popularity back in Bogotá. While the egregiously poor taste of Jungmann and Fortes reflects their being destined to be no more than a foot-note for their meretricious role in the denigration of Chávez’s commitment to gain the freedom of the hostages, their conduct also sadly provides tangible proof of the banality of so many of Brazil’s elected public figures and that great country’s widely noted lack of inspired leadership on a national level. 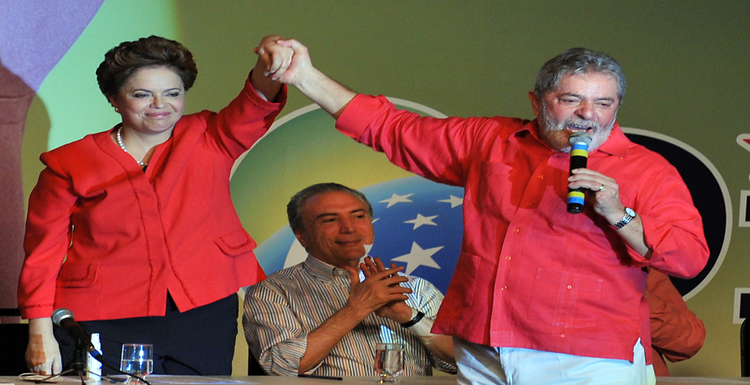 November 3, 2014 COHA Comments Off on Brazilian Elections: Labor Pain?